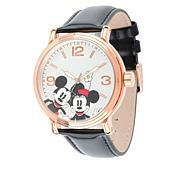 Thrill your favorite grown-up Disney fan with this fun watch featuring Minnie Mouse. 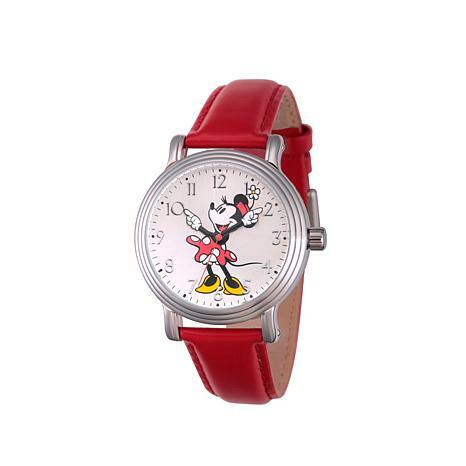 A perky, red leather strap and polished silvertone finish add a touch of class to this beautiful tribute to one of Disney's most iconic characters. Granddaughter never received it. Lost in delivery. HSN immediately refunded the amount, and started a tracking procedure to find it. No problem, Representative very helpful, apologized and assured me she would keep me posted. Love the response FROM HSN staff. Thank you! This watch makes me smile every time I look down to check to see what time it is. Love the soft leather band, the shade of red is bright and a beautiful shade of red. Love all the Arabic numbers being accounted for on the face. 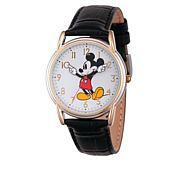 Minnie's arms move to the rhythm of time passing. The face is big enough to represent style and easy to see what time it is on this perfect timepiece.